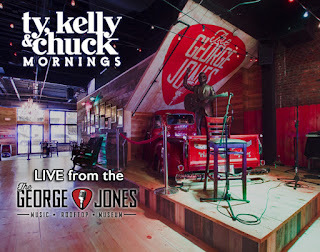 Ty, Kelly, & Chuck Mornings Announce CMA Fest Live Broadcasts From the George Jones! Ty, Kelly & Chuck will be broadcasting live from The George Jones from Wednesday, June 6 through Friday, June 8 for CMA Fest 2018! The live broadcasts are FREE and OPEN to the public with doors to The George Jones opening at 6 AM! For more information and to stay up-to-date on artist announcements or any additional information that may become available, fill out the form here, and subscribe their CMA Fest 2018 email list.